Anti Corruption Front Chairperson Ven. 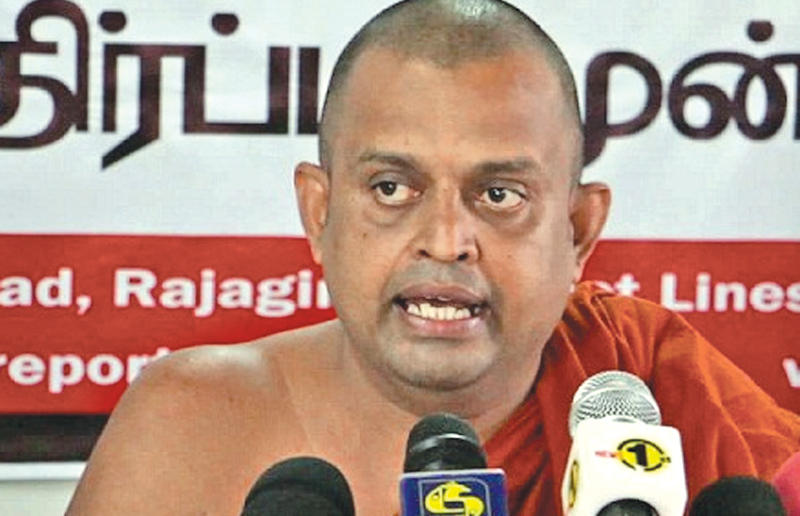 Ulapane Sumangala Thera yesterday sought Supreme Court’s permission to intervene into President Maithripala Sirisena’s reference in SC about the presidential term of office. Filing an intervenient petition in the Supreme Court regarding President Maithripala Sirisena’s reference about the presidential term, the thera said the President has no impediment to continue in the office of President for a period of six years which ends on January 9, 2021. Ven. Sumangala Thera stated that on January 9, 2015 President Maithripala Sirisena was sworn in as the sixth Executive President of Sri Lanka and in terms the Constitution, the sovereignty is in the people and is inalienable. Sovereignty includes the powers of government, fundamental rights and the franchise. The franchise shall be exercisable at the election of the President of the Republic by every citizen. Ven. Sumangala Thera further states that during the last presidential election, the citizens of the country exercised their franchise for the election of a President for a term of six years.He states that therefore it is his contention that in terms of Provisions of the Constitution, the President, has no impediment to continue in the office of President for a period of six years which ends on January 9, 2021. This petition had been filed through Attorney-at-Law Manjula Balasooriya.